The Decker Hotel a luncheon discovery! I love the unexpected stops and the Decker Hotel restaurant was one of them. While heading to the National Farm Toy Show we saw the sign for Maquoketa, a town I still can’t pronounce on the map and googled on my I Phone just what was in this eastern Iowa stop. We found the historic Decker Hotel and decided to give it a try. James Decker built the hotel with the assistance of a New York architect. 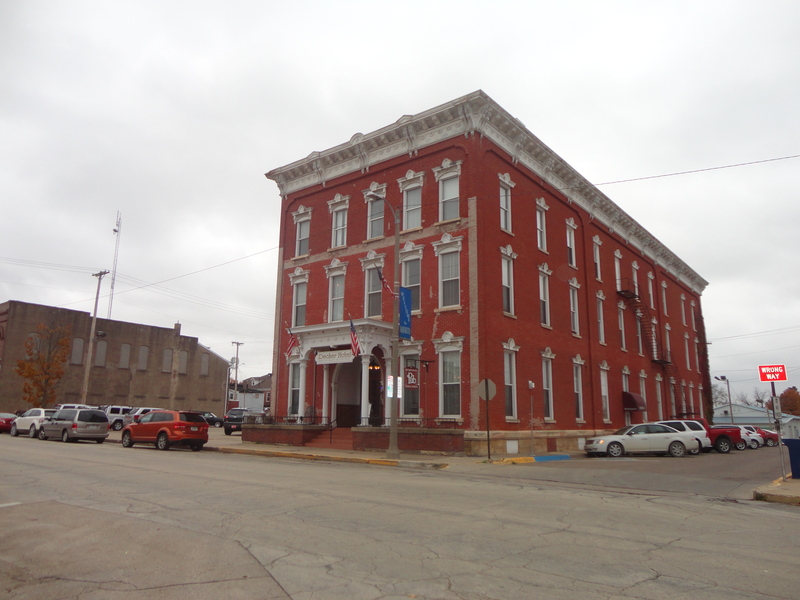 The hotel was built in Maquoketa in the year immediately following the arrival of the railroads and the city’s designation as the county seat. Decker was a jeweler that invested in western states like Iowa where he built the hotel and other buildings before returning to New York. I think this would be a fun place to stay. We headed to the dining room which was quite lovely. The place was pretty busy for a Friday afternoon and we orders simple fare. The food was pretty good, while it won’t compete with some of the places we have been, the wooden booths, the elegant surroundings and friendliness of the staff convinced me to stop again. There were areas I would like to come back and explore like the Maquoketa Caves State Park which they say contains more caves than any other park. The town is situated in the Driftless Area of Iowa, a part of the state that escaped the glaciers. There was an interpretative center that was closed when we drove back through and much to my husband’s dismay I was fascinated by the lime kilns that I didn’t see either. The kilns are evidently located 2 miles north of Maquoketa on U.S. Highway 61. The lime kilns according to historic information I was able to find were built in the 1870’s in what was once called the town of Hurstville. The limestone kilns heated limestone rock mined from nearby quarries to form lime mortar used in building construction and this became an important industry for the area. Yes, a trip back is a must with another stop at the Decker that is located at 128 N. Main Street, Maquoketa, Iowa. Call 563-653-1875 for information. Previous Post: Easley Winery a downtown Indianapolis place to be!